On September 1, 2016 an email was sent to faculty and alumni by former Labor Center Director Eve Weinbaum detailing extensive cuts that had been made to the Labor Center program immediately after she left for a year long sabbatical. Cutting the Director position from 12 months to 9 months. Professor Weinbaum asked supporters of the Labor Center to reach out to administrators and call on them to reverse these cuts. Her call was shared widely on the internet and posted on several blogs. The response was overwhelming. During the week of September 5, 2016 hundreds of alumni and community members wrote expressing support for the program. Is the Labor Center being shut down? The Labor Center is not closing, and hopes to continue doing its work for many years to come! However, the Center’s long-term work depends on institutional support. While the Labor Center is not being shut down now, it is a well known fact that other labor studies programs around the country have experienced death by a thousand cuts. The recent cuts to the UMass Labor Center’s programs will make it impossible to continue in its current form over time – which is why there is mobilization now to reverse the changes. Graduate student funding has been cut drastically. Because of cuts, going forward, there will be zero Teaching Assistantship (TA), Research Assistantship (RA), or externship positions available for full-time Labor Center students. These positions provide funding and tuition waivers that make it possible for working-class students to afford the high costs of studying in a full-time graduate program. The Labor Center’s part-time faculty budget was eliminated this year. The administration has cut funding for instructors who have taught required core courses for many years. These courses include Collective Bargaining (taught by Judy Atkins and Dave Cohen), Labor Law (taught by Harris Freeman and Stephanie Levin), and Labor Economics (taught by Alejandro Reuss). These are all outstanding educators essential to the Labor Studies program. Without them, the Labor Center cannot deliver the full Labor Studies curriculum. The Center is currently using grant funds to hire two part-time faculty because students need these courses to complete their degrees. As of now, the Labor Center has no dedicated staff. When the Center joined the Sociology department in 2010, it lost a full-time clerical person, and the professional staff administrator took over a previous full-time job in the Sociology department. Sociology has far more demands on this position and Labor Studies programs have been severely understaffed, which affects the Center's ability to recruit and administer our programs. The UMass administration is claiming that funding was cut because enrollment had fallen dramatically. But in reality, the opposite is true—as student funding in the form of TA, RA, and externship positions have been cut, enrollments have naturally declined. This is because prospective full-time students simply can't afford graduate education without this vital financial support. ​Enrollments have fluctuated over the years based on the availability of student funding. If student funding opportunities had held constant over the past decade, then enrollment would be steady. Table 1 shows enrollment data over the last decade. In 2006 when there were 30 students enrolled, the Labor Center was able to fund students through eight 10-hour TA positions as well as through the externship program. Cuts to the program more than five years ago, reduced the number of TAs from eight to six. More recently, in 2012, the Labor Center had 6 students with ten-hour TA positions, 2 students with ten-hour RA positions, and 14 students with externships – a total of 22 students with some sort of funding. In 2016, however, the Center was only allowed to continue TA or externship positions for 3 current students who needed them to finish their degrees. Beginning in 2017, there will be zero TA, RA, or externship positions for students. This makes it virtually impossible to recruit students for the program. Without TA, RA, or externship positions, the Labor Center cannot recruit working-class students, first-generation students, or students who cannot afford the more than $60,000 tuition for a two-year degree program. The Labor Center has never held classes with zero or one or two students as administrators are claiming. Is the Labor Center a costly burden for the University? The Labor Center is a minimal investment for UMass Amherst. The Center’s total part-time faculty budget was less than $30,000 per year. TA/RA positions pay the students about $5,000 each (for ten hours per semester), and externships have no cost at all. Because of new budgeting systems, the tuition waivers provided through externships now are calculated as a real cost (considered foregone tuition), making Labor Center programs seem much more expensive than they actually are. Some programs are being permitted to keep their externship opportunities, and the Center is asking for the same. Is the Labor Center running a surplus? The administration is claiming that Labor Studies has been running a “surplus” and therefore does not need new resources. Because of years of careful management, and because of unpredictable budget times, the Labor Center has some funds in reserves. But these funds would be gone with one year of providing TA/RA positions for three students, or hiring a staff person for a full-time job. What about what the new part-time staff person recently hired? The dean, provost, and chair of Sociology are touting the hiring of a half-time staff person to work on recruitment for Labor Studies programs. In reality, this person is being paid with Labor Studies revenues and grant funds – not with central funds. This is financially unsustainable over the long term. Is there internal conflict at the Labor Center? Administrators have referenced “internal conflict” within the Labor Center, but this is not the problem. Faculty are unanimous that the administration’s cuts will make it virtually impossible to sustain a vibrant program in the long term. The faculty also agree that verbal support for the Labor Center needs to be tied to actual resources, specifically student funding and a full-time non-tenure-track faculty position. Is there a new five-year Master's program? 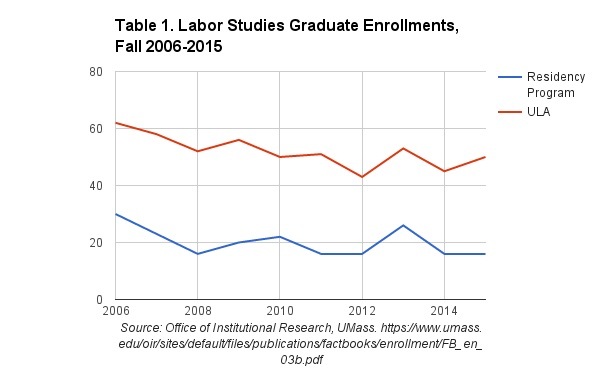 The Labor Center has recently received approval for a new five-year BA/MS program that would allow undergraduate students from the Five Colleges in Western Massachusetts to complete a Master’s degree with one extra year of school. In order to recruit, advise, and create systems to implement this program, the Center must have a faculty adviser for Labor Studies. At the moment there is no faculty or staff support to run this.